Relationship marketing, as I have mentioned in the first part (be sure to read that part to know some classic fundamentals about relationship marketing), is the process of developing a relationship that is not motivated by sales opportunity and is aimed at helping your customers and potential customers by treating them as humans rather than funnel-able leads. Businesses that practice relationship marketing saw a 450% increase in qualified prospects. Blogging is also an art of helping people with your ability to solve their problems or educate them about a topic. As a beginner blogger, you can use relationship marketing strategies to get initial boost to your readers in terms of traffic and subscribers. RM is not only a topic that only big brands should focus on but also one that small businesses, online marketers, and bloggers should try their hands on. Through practicing relationship marketing concepts, you get more connected with your readers and customers, aim at providing them value (it can be anywhere, on social media or in the physical world or through your weekly newsletter). … we can not only win their hearts but also their deals. The additional benefit of focusing on relationship marketing is that the word of mouth of your prospects. It can win you more readers and clients that would otherwise be beyond your reach. Your customers or readers are your boss and not the other way round. The biggest mistake we as bloggers do is to underestimate the power of a single reader. We might think a single reader is not that important but the reality is a single reader has the ability to break or build a business empire. Start building relationships with your every single existing customer. If you have only two of them, consider them as an opportunity to get to other 20. Provide them with what they need. You can also figure out some common problems of your customers (or conduct a survey to find it out) and provide free support on the issue. 2) Use content to inform them and show your dedication. Almost every company that blogs shows content that promotes its products. But there are a few like IBM who use content marketing as a tool to build trust and credibility in the minds of their readers. IBM has around a 100 blogs each writing top notch content that is well researched and data-backed blog posts that form the basis of other smaller blogs’ content ideas. Epic content might be something that you can use till the end of time to attract more potential clients. White papers and researched blog posts are to stay for long and should not be considered as a marketing expense. Writing content that can help the readers does not mean keyword stuffing. If you really want to produce content that aims at serving the base audience of your niche, you have to take care of searcher intent which in a way is writing content according to the demand of your audience. You optimize your content on behalf of how the reader wants it and not the other way round. b) Here’s why to communicate a valuable message through writing. Irrespective of your position in the field in inbound marketing, you need to produce content that continuously strives to be the best value for the time of readers. Your content should aim at developing a communication relationship that brings the audience a little closer than they were prior to reading that. Your content should depict your simplicity and generosity. Email marketing has come up as a great tool for reaching out to your clients and other potential customers. It is a great tool for relationship building that actually increases your ROI by 3700%. An average employee receives about 121 emails per day (source: email marketing statistics for 2019) This is more than enough in terms of chances needed to establish a relationship with a lead. Here are the steps to use email marketing as an effective relationship marketing tool. You could use email marketing to offer free courses and eBooks to your audience. Most sites aim at just sending the RSS feeds to the newsletter subscribers or an occasional marketing email, which means they are under utilizing the potential of email marketing. But Startup blogs like HubSpot use emails for establishing relational marketing campaigns. They offer limitless free bounties based on the audience which helps them to build a loyal relationship which can later be converted to selling leads. They take this further by segmenting email lists so that they can better serve the audience. Here is how to use email segmentation to get a more personal approach and establish a better-targeted relationship with your blog audience. Ace blog Copyblogger Media increased its email signup rates by 400% and needless to say numerous of these subscribers are now the paying customers of the various products Copyblogger deals with. Copyblogger founder Brian Clark created a membership platform, consisting of premium eBooks and Copyblogger products, which gave access to readers in exchange of their email ids and not Dollars. This way they helped numerous bloggers and copywriters in accessing premium guides for free. And this relationship marketing strategy helped Copyblogger to build a huge base of subscribers that could eventually lead to sales. What’s even more is that these satisfied readers spread positive word of mouth that additionally helped Brian to funnel new leads. They are a great example showing how important is relationship marketing for bloggers and modern marketers. I was one of those who came to know about Copyblogger from a happy subscriber. Following up is always an inseparable part of relationship marketing strategies. You gotta follow up on how your posts have helped your reader. If you have already sold a good or service to a prospect, email marketing can be best utilized to collect reviews of the buyer for the product. This is a win-win strategy because it not only helps you to know customer reaction for your product; it makes the customers feel valued too. If there are chances of improvement or any dissatisfaction accumulating in your buyers’ hearts do everything you can to turn the frown to a smile. 4) Social Media – the easiest relationship marketing tactic. While social media is considered an easy and working relationship marketing approach, it isn’t quite a bed of roses. You need to take care to be in the right social media platform in order to interact and build a relationship with the right audience. Proper market research about key customer preferences is also a part of social media approach of relationship building. The biggest relationship marketing tip on social media is to be yourself. You cannot ride it long wearing someone else’s shoes. Here is how to be honest and real on social media. In one of the top and best and miraculous book (yes it is that magnificent! ), How to win friends and influence people author Dale Carnegie mentions great social media strategies that could even be used offline. When starting a conversation begin in a friendly way. Start with questions that would fetch positive answers like “yes”, “agreed”, “how true” etc. A person’s own name is the sweetest sound to him. Use your followers name when interacting with them. Make your clients feel special. Show them how important they are for you. Arouse a sense of eager or want in your followers (for your product or services). Do it cleverly. Social Media is of no use once you don’t aim at adding value to the conversation. Try to boost engagement by helping people out of their problems. It is the most potent relationship marketing strategy for bloggers. If people in your reach are talking about an issue try to solve it even if it doesn’t belong to the niche you deal with. That is what Seth Godin the marketing king conveys here (a must watch if you want to excel in relationship marketing & sales). Recommended reading: 39 tips for Facebook Marketing For Businesses. If you are someone selling something or offering a service, then customer care is a concept you would already know. If you use customer service effectively to build provide value to your buyers this could be a great source for return on relationship. ROR is the value (both perceived and real) that will accrue over time through loyalty, recommendations and sharing, and is used to define and educate companies, brands, and people about the importance of creating authentic connection, interaction, and engagement. Bloggers and online marketers can use their knowledge and experience to help the newer ones make a better start in the field. This way they are not only showing their expertise and authority to their juniors, but also building loyal and strong followers for them. There are numerous examples of relationship marketing where solving the problems of readers have helped bloggers gain an even stronger following. Pat Flynn’s Ask Pat series is successfully helping thousands of bloggers and marketers do their job better. Want some more working tips and tricks on relationship marketing? I am sure our followers would also love this extra token of gratitude from us. So why not give our readers what they want and in return they do what we want. Customer loyalty programs as the process is called, is entirely different from bribing. Here we giveaway some free gifts, discounts or bonuses to our loyal followers as a sign of thanking them for choosing us. The added benefit of loyalty programs on relationship marketing is that we gain even more sales in return of a little investment in discounts to the customers. In order to get on the right track first figure out a reward that the customer is willing or eager to get. The second step it so find a process that makes them get this reward easily. Then you can sit back and enjoy while your customers give you recurring income. Sometimes, if the reward is lucrative enough your customers might refer you to their friends and they in return would refer you to a new set of potential clients. This system of getting help by actually helping others is a great relationship marketing tactic. Bloggers enjoy an advantage in this. Since bloggers have a reach to a wider audience, they can build lasting relationship marketing approach for them. Even if you know a particular lead has never ever stepped your zone, don’t hesitate to help him in his troubles. This is one of the very basic relationship marketing strategies. When I first contacted Sue Ann for a help I needed at my blog, I did not even know Sue or her blog that nicely. But Sue treated me cordially and offered me her help and promise of being there at other times too. This made my bonding with her even stronger and I now am a regular reader of her blog. Needless to say, Sue got a great admirer of her work by practicing relationship marketing. Relationship marketing is all about reaching out, helping every human around you and building an organic rapport. Do not get caught into transactional marketing which aims at building relationships as an after sales process. Transactional marketing and relational marketing are poles apart. Also, stay away from (or at least minimize) interruption marketing which is nothing but the annoying version of traditional relationship marketing strategies. Interruption marketing actually leads you to piss off your potential lead by bombing him with promotional emails, telemarketing (in an aggressive manner) and even spamming. Brands like Jet blue care a lot about their customers and don’t fail to show them a bit. They try every way to help with prompt customer interaction, even through twitter and let you know what they are doing to help you. Other brands like Taco Bell and Zappos are the best examples of brands practicing relationship marketing and actually building a dedicated and strongly woven relationship with their followers. Dell created a special online store for it’s high-volume corporate users. By doing so, it helped them have a hassle-free and speedy shopping experience which surely helps making your customers more loyal to your brand. Harley Davison used relationship marketing to win back the nearly failing bike market by creating a customer centric environment for its users. A new community named HOG (Harley Owners Group) was formed where it allowed owners of Harley bikes a free 1 year membership. Various events like rallies and charities were conducted which helped Harley win back the love of it’s users plus stay in the news by making its users feel they’re a part of the company’s journey. Starbucks is another example of companies that use relationship marketing to bring more loyal customers and business by offering personalized drinks (with your name on it), free WiFi, stay in your seat for as long as you want, and more. These were the basic relationship marketing strategies for bloggers, small businesses, and online marketers, that you must know in order to use it to make more sales and more followers. While the first 7 relationship marketing strategies talk about the best practices relationship marketing, the 8th one deals with certain terms that get confused with the process in order to carry out your effective relationship marketing campaign. Relationship marketing is nothing but trying to reach more people, serve even more people and have an positive impact on humanity by adding your values to it. What is relationship marketing and what are its benefits. The definitive guide to relationship marketing strategies. Best Inspirational Robin Williams Quotes On Entrepreneurship, Marketing & Small Business Management. Hi Swadhin! For some reason, I couldn’t reply directly to you from my initial comment. Thanks you for the response. You’re already doing great with your articles. But since you asked :) Perhaps more SEO related stuff? Great post Swadhin! Good relationship always matters even in the online world. By the way, you mentioned email marketing. I was wondering how many times per week do you send newsletters to your subscribers? We should always try to strengthen and enhance the relationship with our customers is to be loyal, real and authentic to our customer. If we success in developing a tight bond relationship then we can almost assume that we get success in our profession. I have sometimes earlier read post of Ted Rubin, he exactly defines exact meaning of relationship – return on investment. Eventually, thanks for sharing your amazing ideology regarding this subject and this will really helpful in awareness of blogger and marketers. Our readers should feel they are going to get some value from us whenever they visit our blog, being in touch through newsletters, providing premium content, helping through Ecourse, thanks a lot Swadhin for sharing this valuable information about relationship marketing strategies for bloggers, see you soon with another article. Swadhin, long but nice read, enjoyed the whole article. All your points are solid and act as a guide for any blogger or marketer. Marketing is one sector which I need to invest time on now. So the next few months, possibly years :)) will be spent in this field. Thanks for a refreshing and insightful read. This is really a detailed post. 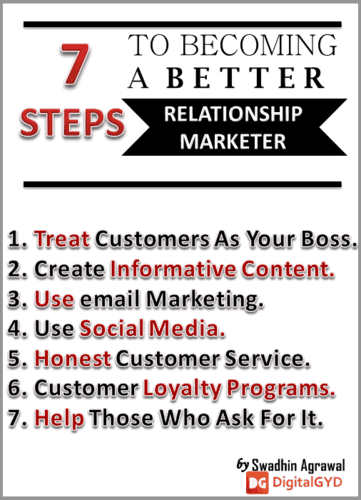 Ya, relationship marketing is the backbone of any successful business. The starting of any business starts with developing an intimacy with the readers on the thought level. We must aim for understanding the thought process of the readers. Pat is doing a wonderful job. He mixes up his podcasts by sharing stories of his son. People love to connect on a personal level. I also want to achieve a personal space with the readers. Our posts should not sound cheezy. Otherwise, people will not pay interest. It’s better to apply an IBM approach and concentrate on providing the content to the readers. In that way, we minimize the gap with the readers. Email marketing is the best way to connect with the readers. This is one of the areas in which I have to learn a lot of things. The copyblogger’s premium account really comes with a wonderful content. They have a wonderful way of connecting with the readers by having a space in giving their e-book series. It leaves behind a more powerful impact. I am learning a lot of things from people like Harleena Mam, you and Rohan. I really love your featured image and your 7 steps image. Thanks a lot for sharing this wonderful guide. Actually, relationship is one of important strategies that every bloggers should a it a trail. I believe that relationship is really important for long term performance because it would get more people to spread the informational about your business. I have trial CopyBlogger Membership, and it was awesome platform. I think that it is really great idea to them as example.. Relationship matters a lot when you are doing a business or start a blog. In both cases a good relationship plays a great role. As you mention in the post that your reader and customer are your boss. I am 100% agree with this point. If we make a good relationship with them they will came back with one another customer and will refer more for you. This will you to spread your business. Its true that if you write what your readers want, then your will get more engagement and traffic to your blog and if you will write what you want, it will give you nothing. So keep in mind your reader first. Email are the best way to deliver content to reader kitchen where they can check your article. We should use email marketing very wisely and should deliver quality content so it can make a good relationship. All the points you have describe are well defined. Thanks for your attempt and sharing with us. After a long time that I haven’t visit your blog due to my lack of non-regularity online, and visiting now reading this piece of information, so am very much blown away by the level of commitment and efforts you’ve put in writing this series of post on relationship marketing. Like Harleena said above, is evidence is the article the length at which you’ve gone to compile every paragraph together from every additional resources your point us to……that’s something most people who attempt to write something epic don’t ave the nerves to undergo. Thanks for sharing with the ABC community, and looking forward to other upcoming series. What a great post! I’m looking forward to your series. It was a pleasure meeting you and now you are a loyal reader – this is exactly how relationships form online and a perfect example of how easy it is to help each other and build relationships. welcome over here.I am glad you liked the post. It means a LOT. Meeting you was such a pleasure. Mostly when you talk to strangers I see they are not as fluid in speaking but at the first reply email itself you were so cordial and I felt we were friends from long. Most welcome sue. Keep inspiring. I agree, Swadhin,. Ever since you started posting on my blog, we have had a great colleague relationship. I always respect what you say on your comments to me. Thanks for the great info in this post and I’m glad we know one another! This is getting better and better each day. It is clearly visible how much time and efforts you put in to craft these competent posts. I appreciate your dedicated commitment to help fellow bloggers and marketers. Thats so true. Every single reader, visitor and customer is so much important for the success of an online or offline business. Indeed, if company blogs always talks about their own products and services they would hardly be able to retain their audience’s attention. Same applies to the bloggers; blogs must help readers solve their problems. I am learning to master email marketing by offering some small bits of bonus content and other stuff. But I am unable to schedule e-mails properly nor I have any defined plan or strategy for it. I guess I need to work a little. Thanks for linking to the relavant sites. They will surely help. I agree, social media is the cheapest and easiest way to connect to people. I have read that Dale Carnegie’s books so many times and even try to implement his tactics and strategies. He was such a great thinker that his books that were written years ago still contain value and are still implementable in this era of changing trends. Thank you so much Swadhin for the mention. The only purpose of starting Ask series is to help everyone at once. Many come asking the same questions time and time again and answering them the same thing over and over again wastes a lot of time and energy of mine as well as theirs. Thank you for those kind words.Your compliments bring the driving force to go forward. Thats what most companies don’t understand. Always shouting about your own products won’t take you where you wan tot go. Instead provide value to your customers and they will themselves come asking for your product. You are already managing email marketing well with those valuable freebies and e-letters. You should start using mailchimp which is free as it would give you a bit more control over feed burner. So you have read his book? Wow. You know Warren buffet also read his book. His book is so powerful in teaching how to influence people that a criminal used it to manipulate women and commit murders for him. lol that’s the dark side though. Thank you for tweeting the tweetables I know you tweeted all of them. So a BIG thanks. Also I am learning to edit pictures. The large one is made from powerpoint. I am learning though. One thing is after uploading the pictures I notice some parts that I have not edited. It happens all the time lol. I liked the hard work and effort put into these series, in the form of all the links and valuable resources you have shared with us, which makes it a meaty post! That’s true indeed – your readers are who need to be valued, they are our bosses! So, we need to cater to them, and write for our readers. Writing naturally is the key, and if you can solve your readers problems through your posts, nothing like it. They’d always come back, looking for more. Oh yes…I can vouch for social media being the easiest and quickest way to build relationships. I loved Rohan’s new series and I am sure they’d come up well. True abut #7 – helping out people is one way to build connections that go beyond and turn to good friendships. Thank you for liking the second part as well. I am happy I did not disappoint you this time. Who else can understand the value of writing if not you. I am always learning from you and your other freelance sites too. Rohan’s series will surely be spot on. Why I mentioned him is he is doing relationship marketing fantastically. He has built so many selfless relations with most bloggers so I though my readers should know of such an example. Thats the ultimate truth. The whole business procedure stands on this wheel – “help others”. Thanks for the mention Swadhin. ROR, Return on Relationship, #RonR… will enhance ROI always. Relationships are like muscle tissue… the more they are engaged, the stronger and more valuable they become.